Ghost Ship off Long Island?? Summer of 2004 and a friend and I were taking the ferry from Orient Point to New London, CT. We had stopped at a quaint little winery on the way and picked up a bottle of wine, and were having a glass on the relaxing ferry ride. It was a beautiful, blue-sky, sunny day when about halfway through the trip the most thickest fog rolled in. It was typical of when people call fog "pea soup." It was so thick and extremely eerie. The captain came over the speaker and said that they'd had to slow the ferry down to a very low speed and would be blowing the horn every so often due to the decreased visibility. My friend and I were occupying an outside bench the entire time and were amazed at how foggy it was. I stood up to the railing as we were having light conversation, upon which, within moments the outline and light picture of a very old ship came into sight. It was a sailing vessel, had 4 or 5 masts, 1 taller one in the center and they descended down in height from there. There was no wind, no breeze, it was just silent and very...eerie. That's the only word I can think of to describe this experience. The ship looked very old, like something from the 1800's?? It was traveling in the same direction of us and seemed to be only a 1/10 of a mile away. Not very far, but not right next to us. I was in awe! You couldn't see any wood work or real masts or people, it was just a grayish shape of a ship. I asked my friend if she could see it and she stood up and said she couldn't. As fast as I started to point to it, it just sort of disappeared. I know most can think, well if it was so foggy, it could have just been another boat, but it was close enough, and old enough to know that it just wasn't. It's the only experience I've ever had seeing something "ghostly." 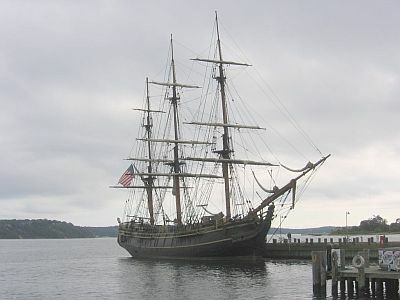 Editor's note: It's possible that what you saw was the HMS Bounty which was located on Long Island's North Fork at that time. Another possibility is that every now and then there's a gathering of tall ships in Greenport and sometimes other North Shore ports. The ghost ship you saw could have been a boat on its way to one of these events. Comments for Ghost Ship off Long Island?? My wife brought my daughter and son (26 and 21 yrs of age) to orient point park on a cloudy misty day in 2005 before she went back to college, she wanted to go there one last time. They were walking on the beach talking when a slight fog rolled in and my daughter said "Mom, check out that old schooner ship!" It was old wood, no sails, no wind, 3-4 large masts and close enough to see that it was unmanned??? Moving around 7-8 knots very slowly. All three of them took pictures because my daughter was studying photography at the time and she wanted to add some special effects to it. Wouldnt you know it? When all three looked at their phones it just showed the water, no ship? I was like, were you guys drinking or something? She was like no, we had a little picnic and were coming straight home afterwards...it was the coolest thing! So eeerie, I love stories like that!